CBS News correspondent Clarissa Ward crossed the border into Syria six times in 2012 to bring the realities of a brutal civil war home to America. For their work, Ward and her colleagues were awarded the prestigious Alfred I. duPont journalism award for 2013. LONDON I first met Bassel Issa in February 2012. At the time, he was leading a group of rebel fighters who called themselves the Syrian Liberation Army. In reality, they were more local militia than army. Most were farmers or workers, ordinary hard-working men who had grown up together and decided to join the fight for a free Syria. Producer Ben Plesser and I had traveled illegally from Turkey to the city of Idlib, in Northern Syria, to live for a week with these men and their families. Bassel immediately caught my attention -- not because he was the leader of the group but because he was quiet and thoughtful and not partial to the braggadocio one so often encounters in rebel leaders. Wiry and lean with a broad toothy smile, he stood sucking down cigarette after cigarette, taking in everything that was going on around him. We followed Bassel and his men into battle with Assad's forces, and realized they were unprepared. The men had no two-way radios, and only the most rudimentary weapons -- AK-47's and a few grenades. After the battle, we went to the hospital. Bassel looked on helplessly as doctors pronounced one fighter after another from his group dead. Four of them died that day. The room echoed with the wails of grieving fighters and family members. Two days later, Ben and I left and went back to Turkey. There were reports that President Bashar Assad's tanks were closing in on Idlib and that an assault on the old city was imminent. 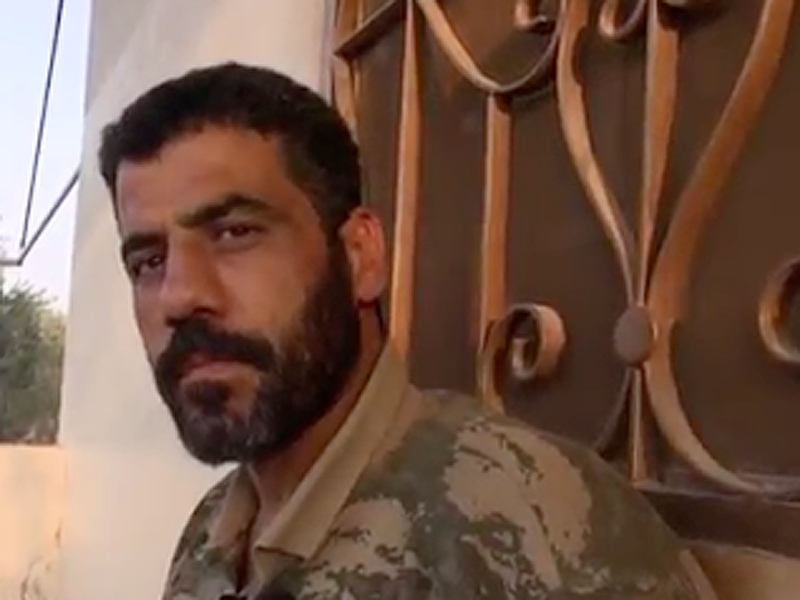 I next saw Bassel Issa in June, when he walked into the house where I was staying in the town of Maraat Misreen, near Idlib. He drove me out of town to a farmhouse where he and his men were living, regaling me with tales of their military exploits as we bumped along the dusty road. After the government assault on Idlib, he and his men were forced to leave their city and their families behind, he told me. They had renamed themselves "The Idlib Martyr's Brigade," and they had a larger supply of heavier weapons, though Bassel still complained about the soaring price of bullets and a lack of support from the West. It was Ramadan, so the men were fasting during the day and tired, but there was a sense of hushed excitement in the air, with rumors flying around that a major rebel assault on the key northern city of Aleppo was imminent. Bassel was looking forward to leading his men into the fight. At the end of the visit, I gave him a bag of candy and small presents to give to his family for the Eid celebration that marks the end of Ramadan. He flashed me his wide smile and we said goodbye. The last time I saw Issa was in October, when Ben and I were driving back to Turkey from Aleppo. At the Bab al-Hawa border crossing, we heard an excited cry coming from one of the cars - "Bin! Bin!" It was Bassel Issa calling out to Ben. He climbed out of the van he was riding in and gave Ben a bear hug. I stood back, babbling excited Arabic greetings and holding my hand to my heart, feeling that familiar sensation of mild frustration that I could not express my happiness at seeing him with a big hug or at least a squeeze of the hand, for the sake of cultural sensitivity. He was in great spirits, confident that the regime would fall soon and looking forward to reclaiming Idlib. I happened to be carrying a little bag of treats with me, which I stuffed into the car with him as he was leaving, instructing him to pass them on to his children. "Allah ma'ak," I told him, "God be with you." In November 2012, I go the news that Bassel had been killed in an airstrike during a battle in the town of Harem, near the Turkish border. The news touched me profoundly. I had always known he might be killed, but I still felt winded. Bassel was a decent man, a humble man, full of humor and grace. He was brave and generous and he had heart. He was one of the more than 40,000 people the opposition says have been killed in Syria's civil war, and that war looks certain to continue claiming lives into 2013.